Bookassist Intelligent Pricing mixes rates and discounts in the IBE so that your hotel can always offer the customer the best available rate for the total stay. We mix the best available rates and best discounts on each night of the stay to improve conversion and help you get more direct bookings. Bookassist Intelligent Pricing built into Booking Engine provides a super-flexible configuration that allows for mixing discounts with specific conditions as well as mixing rates across different rateplans with different conditions. 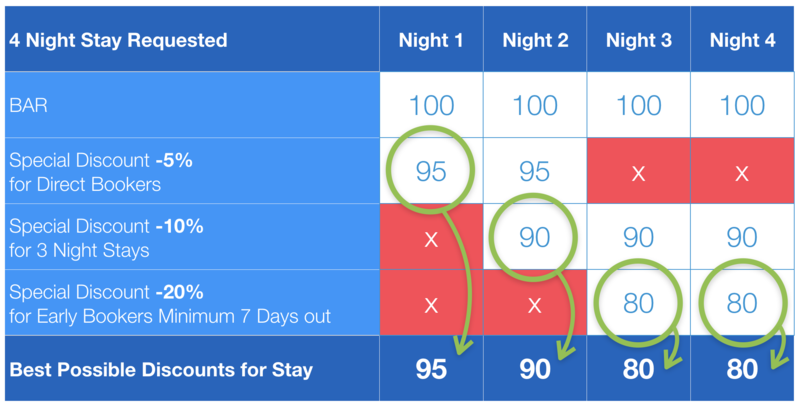 When a customer is requesting a stay across period for which the hotel offers different discounts, Bookassist Intelligent Pricing can automatically find the best rate or discount available per day of the stay and offer the lowest overall price for the stay to your customer. There are special offers for direct bookers online that would be valid for the first two nights. There’s a second offer for three night stays that would be valid for the last three nights. Finally, there is an additional better offer available for early bookers that would be valid for the last two nights. Since all conditions should be valid for the booker on certain days when looking for the 4 night stay, Bookassist will automatically determine the total price by mixing the rates and discounts and selecting the lowest valid price on each night of the stay. In many competitor booking engines, the customer fails to qualify for the various discounts when requesting a 4 night stay, and ends up with a quotation of €400! With Bookassist Intelligent Pricing, the customer is quoted the best rate of €345, or almost 14% lower than many competitor engines. Bookassist Intelligent Pricing now also drives Google Hotel Ads to ensure the meta search channel is as competitive as possible for our partner hotels. Intelligent Pricing drives conversion and better direct business. When taken together with ultra-fast and modern features such as Price Calendar, the Bookassist Booking Engine represents the ideal platform for booking conversion, improving the guest interface and reducing the frustration that competing systems produce. ​Bookassist has completed and certified full two-way integration with the latest TravelClick Channel Manager API. Bookassist ecommerce platform is now connected for ARI, updating prices, availability and restrictions through the new connection, as well transmitting reservations.